Golf online websites offer an array of unique collections not seen in country club pro shops or golf stores. 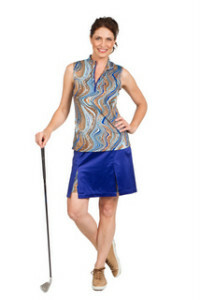 Animal prints in women’s golf clothing doesn’t always have to be black, while and brown. Look for vivid jewel colors in sapphire, espresso and peridot green with swirls of colors. It’s nice to see progress of women’s golf clothes,online websites offer really great stuff, beautiful prints and colors.